Even though Sunday’s are the start of the week and the day before Monday, I really do love my Sunday’s. Marc and I have a date day, plopped in front of the TV watching football, eating pizza, not caring about our showers or the fact that we are still in our pajamas at six o’clock at night. This Sunday is no different. I woke up at my usual 6 am pee session and headed downstairs to start making my coffee. Did the dishes from the night before and relaxed for a few hours reading New Moon. 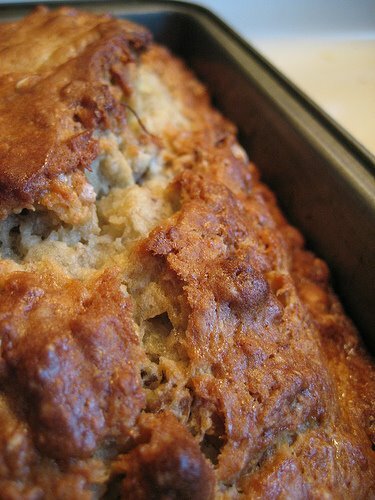 I also took some banana’s out of the freezer to make some banana bread to munch on during the day. Why this sudden burst of energy? Who knows… maybe I am nesting! My mom bought me a new Pumpkin Spiced candle and between the smell of cinnamon and nutmeg from the bread and the burning of the candle, it smells quite “fallish” in our home. I am feeling a bit better. With only 12 more days until my due date, Marc and I are doing whatever it takes to bring this baby home! I think he has dropped some as well; I am not out of breath as I reach the top of the stairs. But my stomach is still growing, let me tell you that! Let’s just hope that the doc has some good news for me on Tuesday, like “WOW, you are 2 cm dilated!”. Hey, a pregnant girl can wish, right?